The Use Case Diagram is one of the Unified Modeling Language (UML) Behavioral diagrams that can be used to describe the goals of the users and other systems that interact with the system that is being modeled. They are used to describe the functional requirements of a system, subsystem or entity and present a simple but compelling picture of how the system will be used. They are typically used in conjunction with higher level Business and Stakeholder Requirements and are often supplemented with a set of Non Functional Requirements. The Use Case Diagram is used to describe the goals that users or other systems want to achieve from interacting with the system. They always describe the goal from the Actors' perspective, the details of the Use Case will describe the goal with more precision. Use Cases will often act as the basis for the definition of Test Cases. 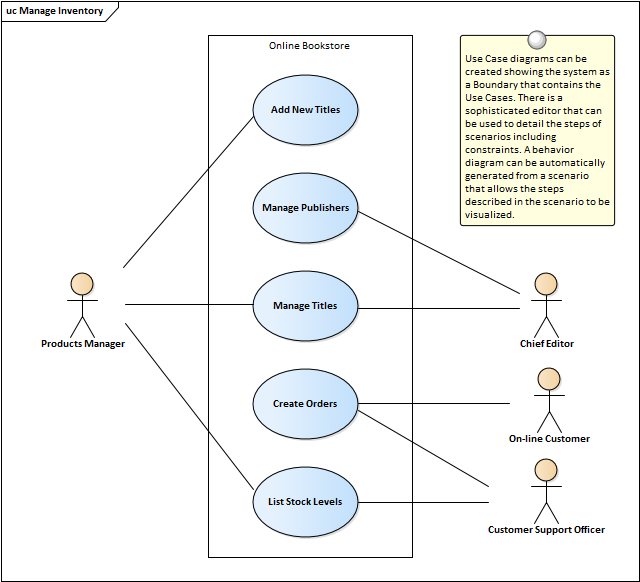 Any number of Use Case Diagrams can be created to represent different parts of a system or Packages of Use Cases. The diagrams can be kept simple or they can be structured by the application of a number of additional connectors such as Include, Extend and Generalization relationships. A system Boundary can be included that is used to name the system, subsystem or entity under discussion; the Actors lie outside the Boundary and the Use Case inside. Use Case diagrams can be used to show how the Use Case are related to other elements in the system, including up-stream elements such as Requirements and down-stream elements such as Components. 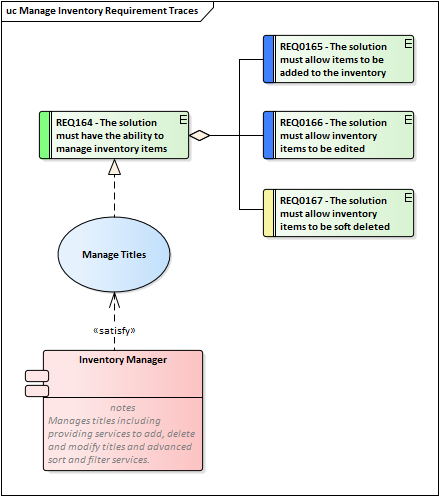 The Use Case diagram (as for any diagram) can be viewed as an element list, which makes working with the element's properties easier. Diagram Filters can also be used when presenting the diagrams, to draw attention to parts of the diagrams and the diagrams can be presented as hand drawn or in a whiteboard style by changing the properties of the diagram.